Attract birds to even the smallest yard by following these simple steps that will turn your backyard into a bird sanctuary. Creating your own bird sanctuary takes some time, but the creation itself is half the pleasure. Native plants will thrive so will be cost effective and will attract songbirds right to your home. Of the many beautiful birds I've seen out in the field, none has been so thrilling as the birds I've seen in my own back yard. My husband keeps a bird list, and he has seen 78 different types of birds in our small yard! One morning, sitting on my back porch with a cup of coffee, I spotted a Rose Breasted Grossbeak at the bird feeder - a gorgeous creature whose vivid colors and unexpected visit coincided with the purchase of a plate with a picture of that very bird at a Good Will store. It was a magic plate! Now, I'm not suggesting that you run out and comb flea markets for bird plates as a method of attracting some feathered friends, just saying that your own private bird sanctuary can seem like a magical place. Like the time I was sitting out on the porch (again) reading and a Carolina wren came to perch on the toe of my shoe. Or the Coopers hawk that landed 6 feet above me in the oak tree. The appearance of a bird you've never seen before can feel like magic, can make your whole day. That is the day you realize that you've succeeded in creating a real backyard bird sanctuary. The easiest way to attract birds is by placing a bird feeder somewhere visible from the house. Make sure the feeder stands in a sheltered location or under a tree as hawks cruise backyards shopping for a meal. You may not care to provide lunch for a hungry hawk, that can frighten the children and leave quite a disgusting mess. Buy a spring loaded feeder to thwart squirrels. You may think squirrels are cute but their appeal wears thin as they gobble up bird seed by the pound. 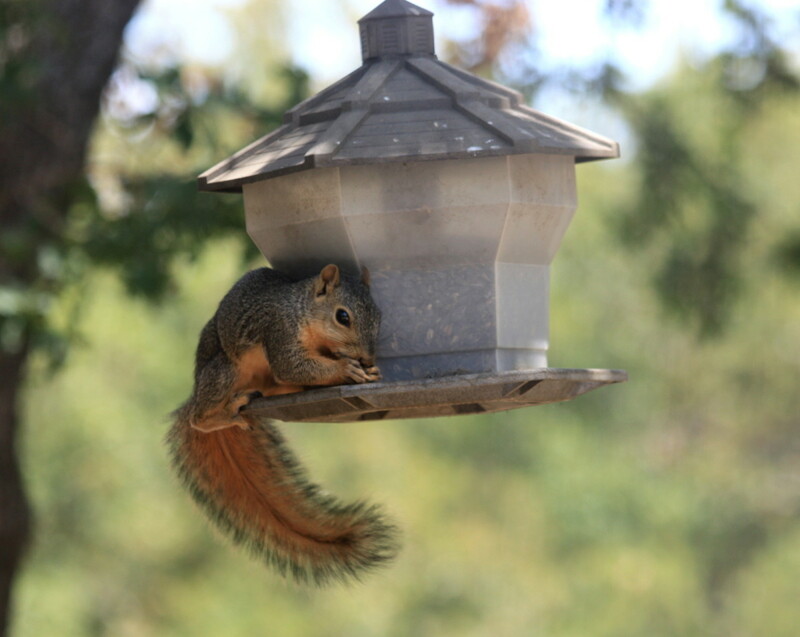 A spring loaded feeder closes off access to bird seed as the weight of the squirrel pull it closed. Store birdseed in a metal container as squirrels, rats, and other unwanted critters can tear into a plastic tub. Black sunflower seed is popular with birds and has the high fat content birds need, especially in winter. It's cheaper than striped sunflower seed and has a softer shell. Thistle or niger seed is a tiny black seed best offered in a special feeder. 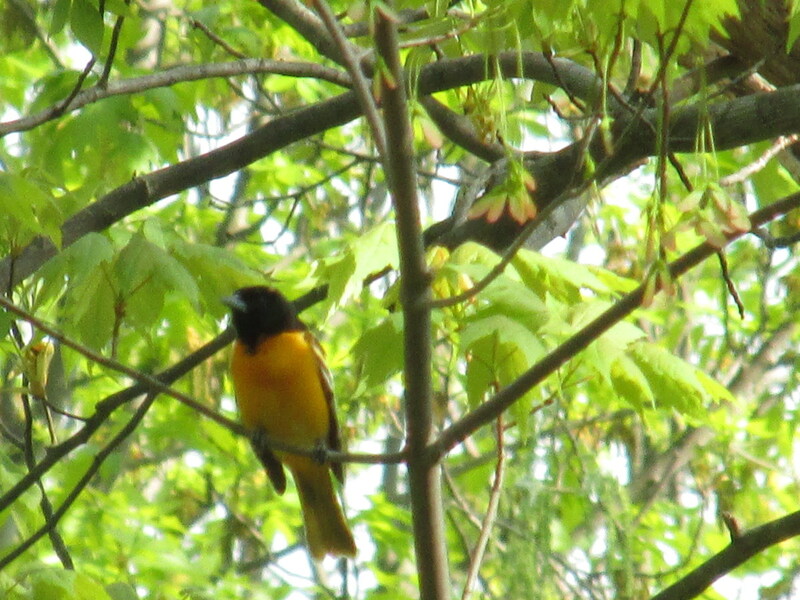 It attracts chickadees, goldfinch, titmice, and other small songbirds. Do not buy the cheap bags of mixed seed. The red millet goes largely uneaten and the white safflower seed attracts pesky birds like starlings and grackles. A hummingbird feeder consists of an upended bottle with several feeding ports. Filled with commercial or homemade nectar, it will attract those amazing little creatures and keep them coming back. Suet Feeders are small wire cages to hold suet (a blend of fats and seeds) that attract Downy woodpeckers. Unfortunately, they also attract nuisance birds like Grackles and Starlings. Of course, all living creatures need water which can be hard to come across in many urban and suburban neighborhoods. No back yard bird sanctuary can be without a water feature. You can go whole hog and dig a pond, buy an attractive bird bath, or merely keep a shallow basin filled with water. A fountain or waterfall in a pond provides the soothing sounds of splashing, so peaceful for you and attractive to birds. If you decide on a pond, first do your research and do it right to avoid frustrating and costly mistakes. Check with local government to see if fences or permits are necessary for your area. In my domain, any pond over 2 feet deep needs to be sited in a fenced yard. In areas with cold winters, you need a depth of 3 feet so that fish and frogs can overwinter. Site the pond so that it gets some shade to avoid algae build-up. a fountain or waterfall moves the water and a filter cleans the water. You dont' want a stagnant pond stinking up your sanctuary. So do your homework. 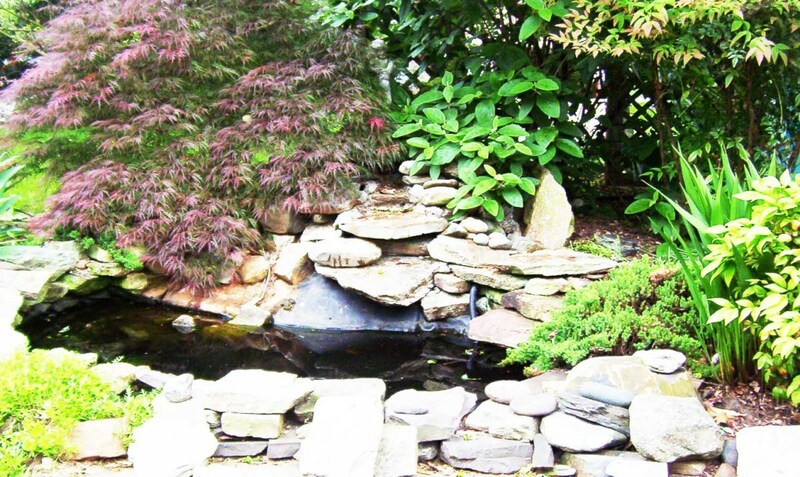 If you don't want the hard work or headaches of a pond, consider a bird bath or basin. Dont' set the water below a bird feeder as seed debris and bird droppings will quickly foul the water. Change the water frequently, every day in warmer months to avoid mosquitoes. Occasionally clean the bird bath with a scrub brush - it can get yucky. Your back yard bird sanctuary must offer shelter and natural food to attract birds. Stick to the native species which birds prefer. Native trees, shrubs, and plants long adapted to your region will thrive in local conditions. Native plants vary with the area you live in. consider planting zones as well as regional differences. 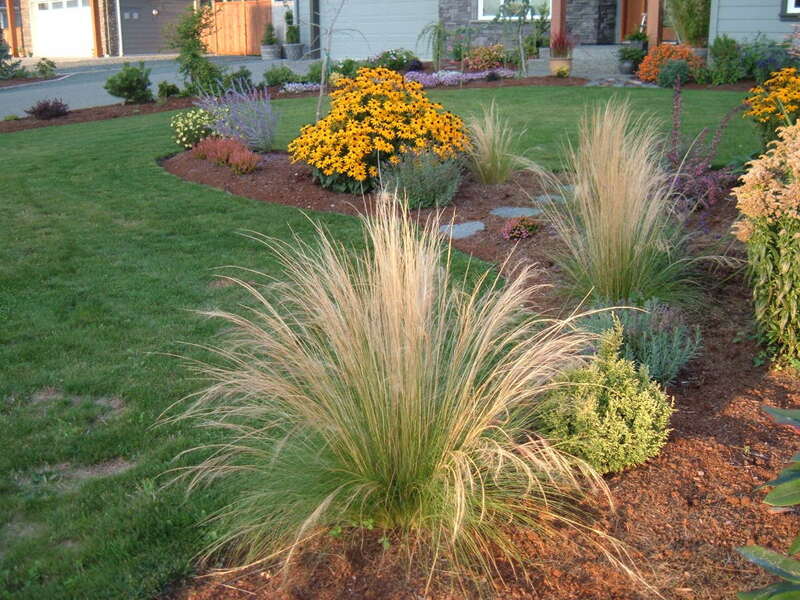 Complete a list of the types of areas on your own property in order to select appropriate plants to match each site. think of several aspects of your property. Are you on a slope? a rocky area? Is your yard in a large, field-like area, or are you surrounded by woods? Moisture. Is there a low point on your property that is usually damp? Is there good dranage? does your local weather pattern fluctuate between a rainy season and drought? Sun, shade, or partial shade. Do you have established plants on your property? If you have a mature tree or two, use these as the basis of your plan. consider the shade they cast and adapt your plans around the trees. Your first purchase should be trees. Trees provide you shade n summer so locate your tree in the most advantageous spot for maximized summer shade. You'll save money on the air conditioning and be able to enjoy time outdoors when it's hot. Locate large growing trees at the greatest distance from your home that your property allows. Threes will be the background of your masterpiece and enhance the beauty of your home. birds love trees for shelter, food, nesting, and just hanging out. Study available native species that offer year round interest to you and the birds alike. Many trees produce seeds and berries that attract birds. Mix in some evergreens for winter shelter and a lovely splash of green in grey winter months. Birch trees vary in the type appropriate for your area. the beautiful white birch grows best in northern climates. River birches fare well in warmer areas. with their lovely, peeling, salmon colored bark, river birches provide year round interest and can grown to 75'. They will tolerate both spring flooding and summer drought. Yellow bird at 80' is attractive year round and prefers cool, moist conditions. 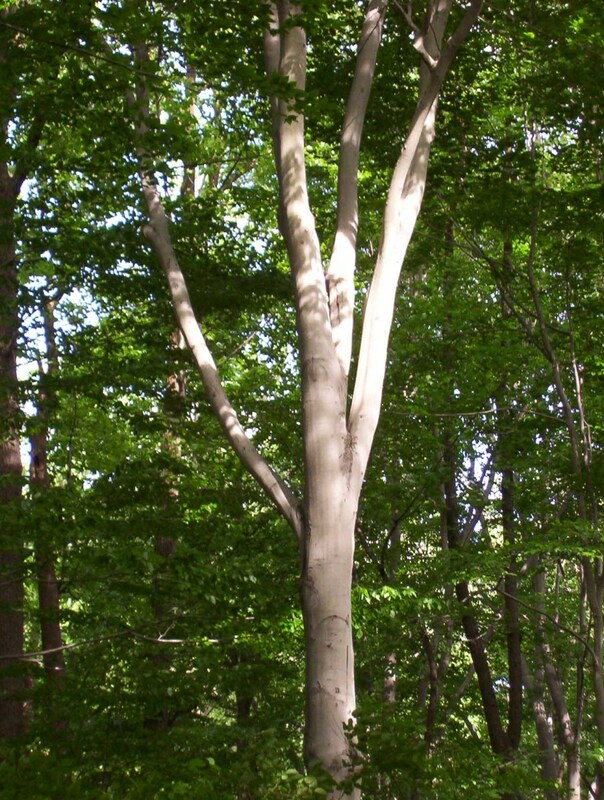 Beech trees with their smooth silver bark are large trees for a large lot. Ash (green, red, and swamp) grow up to 75' and tolerate both flooding and drought. White ash (50' - 100') is a fast grower with good fall color. Sycamores with their patchy peeling bark are beautiful trees that are adaptable to a variety of conditions. These are large growing trees for year round interest. Elms grow into tall, vase shaped trees perfect for shade. In the 1960s Dutch Elm disease destroyed these lovely trees and many still be considered a threat. Locate Dutch elm resistant specimens. Eastern Redbud is a small 20' - 30' tree with lovely heart shaped leaves and pink to lavender spring blossoms. Willow trees are beautiful and fast growing. They are the first to leaf out in spring and the last to hold their green in fall. Willows love moisture so if you have a wet spont, a willow would be perfect. However, fast growing trees die young so may break your heart. I'll never forget when our beautiful Wisconsin willow suddenly died - how my son and I sat on the back porch crying as the tree man tore it down. 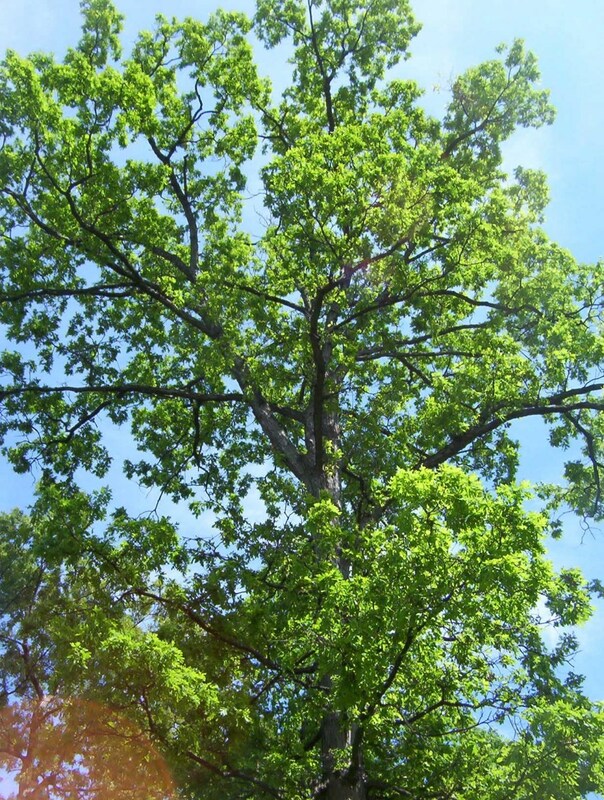 Oak trees are tall, long lived, noble trees with a great variety of types including the spectacular live oaks of the south, tall red oaks, and wide spreading white oaks. Maples come in a vast array of shapes, colors, and sizes. Sugar maples turn vibrant colors in fall and grow up to 100 feet tall. Silver, white, river, and soft maples become huge trees as well, but don't produce a spectacular fall display. American hornbeam is a slow grower up to 40' but can be short-lived. White fringetree is a small up to 35' tree with good fall color, and flowers in spring. Dogwoods are small trees, 25' - 30'. Pagoda produces spring flowers and enjoy some shade. The fruits attract birds. Cockspur hawthorn is another small tree that appreciates dry rocky places or low, rich slopes. Crab-apple (10' - 30') produces beautiful, fragrant spring flowers and sour little apples popular with birds. Evergreens provide year round color and year round shelter for birds. There are so many types of evergreens, it's easy to find several suitable types for your yard. White pine with its long, soft needles is a large, wide spreading, aromatic tree, attractive to birds for winter cover and food. Pitch pine (50' - 75') provides food for birds and lives on slopes as well as moist areas. Virginia pine or Jersey pine is tolerant of moisture, grows 70' - 90' tall and provides food for birds. Native shrubs are attractive and adapted to your climate. they provide food and shelter for birds and beautify your property. Shrubs offer privacy and a wide variety of texture and color to your masterpiece. Shrubs can grow large as a small tree or be low growing. shrubs can be evergreen or flowering or have interesting color variations and leaf shapes. consider shrubs that offer berries that birds can eat during colder months. American beautyberry or French mulberry is a tall shrub that flowers in summer and produces lavender berries in fall. New Jersey Tea bush is a small, tough shrub with white summer flowers and black fall fruits. Buttonbush, a tall shrub, needs sun to produce fragrant flowers. It tolerates both drought and flooding. Sweet pepperbush is another tall shrub that produces fragrant flowers. It is somewhat salt tolerant. Huckleberry, raspberry, blueberry, and blackberry are medium sized bushes that offer fruit to both birds and humans. Witch hazel can grow tall as a small tree and is noted for its fall color and winter blooms. Wild hydrangea grows 3' - 6' and flowers throughout the summer. Its leaves are poisonous to humans. Inkberry grows 6' - 10' and flowers n late spring. It produces black colored berries in winter and tolerates some salt flooding. Many of our favorite perennials and ornamental flowers are native plants. Carefully select plants with a variety of blooming tines so that you will always have flowers. Flowers attract beneficial insects, bees, butterflies, and hummingbirds. If you dead-head flowers to encourage new blooms, end this practice as fall approaches. Allow flowers to go to seed, which provides food for smaller birds. some seeds that fall to the ground will propagate and spread your native flowers, growing your garden and saving money on plant purchases. Native flowering plants differ depending on your area of the country. But many area are home to several attractive flowering plants. Solidago, also called goldenrod is beautiful and adaptive to many conditions. there are many varieties of solidago. they make a great filler in floral arrangements and attract butterflies. Asters. there are many types of asters from the tiny white September aster to the tall growing, vividly purple New England Aster. the 6' New England aster can be trimmed back in summer so that the plants don't flop over from the wight of the fall flowers. 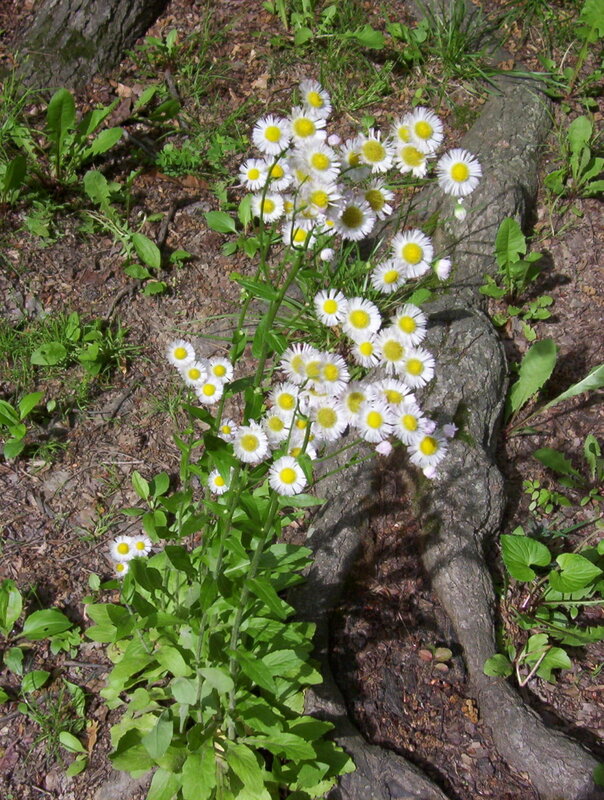 Asters generally bloom from late summer into fall. Indigo or baptisia is a shrub like plant that prefers sun to partial shade and produces blue to violet flowers in spring. Meadow rue come in both early blooming small and tall late blooming varieties. 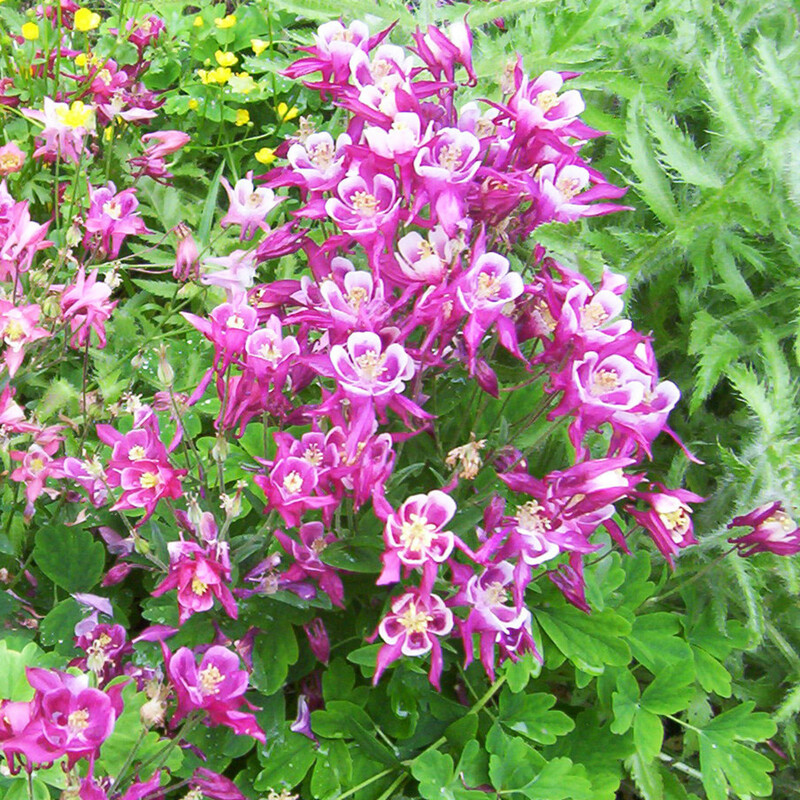 Columbine is a delicate 3' plant that enjoys sun to partial shade and bloom in a variety of colors in spring. Iris.The wild kind are smaller than the large hybrid irises and like moisture. Joe Pye Weed is a tall (6') showy plant with dark stems that contrast with bright, green leaves. It flowers a violet or pink fluffy bloom in late summer or early fall. Cone-flowers bloom yellow, white, and violet or purple. They prefer bright sunshine and spread easily. Goldfinch love the seeds in fall. Queen Anne's lace is a 3' plant with fern like leaves and a lovely round white, many bloomed flower. Phlox come in many sizes and produce tiny white to purple flowers. 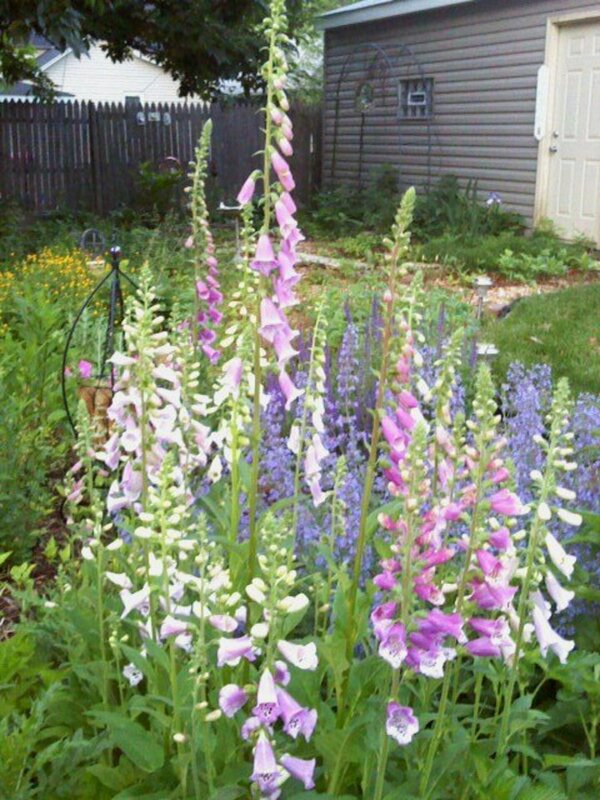 Obedient plant or dragon-head is a tall lant with pink to purple flowers in summer. Prickly pear cactus, the only cactus native east of the Mississippi, produces luminous yellow flowers in June. Sundrops are small plants with yellow flowers. Lobelia is a delphinium like blue flowering plant that blooms late summer to mid fall. Liatris is a tall, feathered spike that blooms white, pink, or purple and is popular in floral arrangements. Butterfly weed likes dry areas and is a bushy plant whose orange flowers attract butterflies. Snakeroot is a shade loving plant that produces spiky white flowers from June to September. Solomons seal is a shade loving plant with white edged leaves that dangles tiny white blooms in early spring. Robin's plantain grows a little over a foot tall, prefers partial shade and flowers all summer in shades of flue, pink, and white. It likes open woods, meadows, and roadsides. Going native is an involvement with your local environment and community. You can find native plants at some area nurseries. environmentally friendly organizations often have spring plant sales that offer native plants grown in your region. Clubs and organizations have sprung up around streams and watersheds as well as area parks and arboretums and encourage the use of native plants by holding plant fairs and sales. For most folks, going native all at once is an impossible task due to the cost and labor involved. Instead, replace dead or invasive, and non-native plants slowly over the years. Introduce a new plant or two every season. 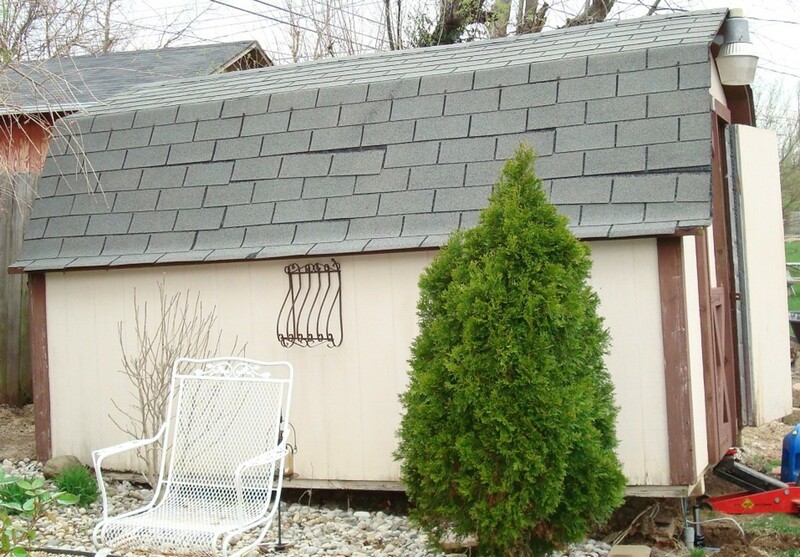 With an ever changing palette, your backyard masterpiece will evolve over the years providing ongoing interest. The joy of turning a blank canvas into a natural garden is an involement in the act of creation that leads to a spiritual connection with nature. I have been feeding wild birds since 1982. In 1981 an unidentified songbird appeared in my yard. It was the size of an American Robin and it had a tiny bit of yellow and a tiny bit of red. It looked most like a Flycatcher or Kingbird. It seemed to be an exotic. It was injured. What it was, where it came from, or how it became injured are questions I still ask to this day. It died the following day of its injury. Was it somebody's escaped pet? While doing volunteer work at a sanctuary, I befriended an American Crow. Crows are highly intelligent and make wonderful pets. They eat pretty much anything, but they prefer meat. House Sparrows, White throated Sparrows, European Starlings, Common Grackles, Northern Cardinals, Mockingbirds, American Crows and Blue Jays are daily visitors. Dark eyed Juncos or Snowbirds come during the cold part of the year, and Evening Grosbeaks, Downy Woodpeckers, and Black capped Chickadees are rare visitors. Mourning Doves also come everyday. My favorites are the Rock Doves or Pigeons as they are the friendliest and the most easily tameable of wild birds. Some of them perch on me and take food from my hand. The friendliesf wild bird species are House Sparrows, White throated Sparrows, Brown headed Cowbirds, Pine Grosbeaks, Nuthatches, Red Masked Conures, Rainbow Lories,Scrub Jays, and European Robins. California's Telegraph Hill in San Francisco has a flock of Red Masked Conures who were tamed by author Mark Bittner, who wrote a book and made a movie, The Wild Parrots of Telegraph Hill.